Did you know that most patients rate their dental health much higher than reality? Patients correlate good dental health with lack of pain. A significant segment or the population has various types of untreated dental problems. Lack of dental pain does not necessarily mean that the patient does not have active dental disease. Sometimes it is difficult to get that point across if the patient has no pain. A great example is periodontal disease (gum disease). Studies demonstrate that more than 65% of the population has periodontal disease and most of those people have little or no pain until it progresses to an advanced stage. Patients may experience dental abscess, swelling and eventually extraction of the tooth. In addition, periodontal disease is also associated with heart disease and diabetes. It is important that every patient takes periodontal problems seriously and treat it at an early stage. Treatment at this early stage will not only be less expensive but it will also insure a better outcome. Some medications that patients are on cause dry mouth; it is an important factor to watch for, since saliva not only has a cleansing effect but also contains a protective enzymes to fight bacteria. Certain medical conditions or history of radiation of the head and neck regions can cause dry mouth, which will increase the rate of tooth decay. Patients that have large amalgams (silver/black restorations) need to be especially careful since these teeth are more prone to fractures. 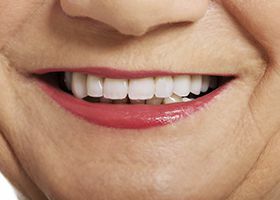 With our older population, dentists often notice moderate to severely worn teeth due to natural wear and tear and other times due to grinding or clenching habits. Severe grinding can result in shorter teeth that make a person look older due to the fact that their vertical dimension has decreased. As the bite changes, it can progress to malocclusion (uneven/irregular bite) especially in the anterior teeth. This can cause traumatic occlusion and bone loss. Most patients are not aware of any malocclusion until they experience significant tooth mobility. A large portion of dental patients in our community are over the age of 50. Commonly these patients have mild to severe gum recession that is usually the result of aggressive brushing and using hard bristle toothbrushes. In severe cases soft tissue loss is usually accompanied with bone loss around the tooth. Even with a moderate amount of gum recession, patients expose the roots of their teeth. Brushing on exposed roots leads to loss of tooth structure, since exposed dentin is much softer than enamel. In mild to moderate cases of gum recession where surgery is not indicated, exposed root surfaces can be easily treated with a tooth color restorative material. In most cases this can be done without anesthetic. This will immediately stop the deterioration of tooth structure and eliminate sensitivity. Patients may have decay or badly exposed roots but still have no signs or symptoms. Since there is no pain, patients often think it is not important to get treatment. In younger patients, exposed roots can result in extreme sensitivity to hot/cold.